Swimming is a great exercise which involves most of the muscles of the body. It increases muscle strength and cardiovascular health by increasing the heart rate. Swimming is an ideal aerobic activity because it provides all the benefits but reduces the stress aerobics put on the body. People who regularly include swimming in their routine tend to have healthy lungs and a healthy heart along with increased endurance. This exercise provides a number of benefits, both physical and mental. It serves as a relaxing activity which also alleviates stress and reduce anxiety. However, it is important to prepare properly before you dive in to prevent problems associated with swimming. Swimming itself does not have any adverse effect on the body but there are some factors which might be responsible for unpleasant after effects. Most swimmers complain of having pounding headaches after a swim. . It is quite frustrating for a swimmer to have severe headaches between laps. This is very common and can be avoided by taking appropriate measures. Headaches after swimming or commonly known as swimmer’s headaches are caused by various factors such as ill-fitted goggles, tight swim caps, dehydration, earplugs or lack of oxygen. Most common type of headache after swimming is known as external compression headache (ECH) which is caused by some external object putting pressure anywhere on the head, frontal region or facial region. Swim kits like goggles and swim caps are often the culprits. A swimmer can have external compression headache if the goggles or swim caps are too tight. During a swim if water leaks into the goggles a person’s first response is to tighten the goggles. This might trigger a severe headache as the goggle strap increases the pressure around the scalp and forehead. The headache are caused due to compression of the cutaneous nerves and it can last up to an hour even when the swimmer removes the goggles. If goggles are the problem then they should be replaced with ones with better fitting and soft rubber material around the eyes. The goggles should also be carefully and properly placed to avoid exerting pressure. Investing in good quality goggles that serve the purpose and also provide comfort during swim is important. External compression headaches are the most reported kind of headaches swimmer complain having after or during swimming. This headache after swimming is caused by if pressure is exerted on the scalp or any other facial or frontal region due to things like tight goggle band or tight swim cap. These headaches can also be accompanied by other things like painful hair or scalp and eyelid neuromas. There are a number of nerves like the supraorbital nerve (located above the eye socket and below the forehead), supratrochlear nerve, auriculotemporal nerve (located on the lower jawbone), zygomaticotemporal nerve which when pressurized due to ill-fitting or uncomfortable goggles can cause severe headaches. Any exertion caused by goggles triggers a throbbing headache when a person dives in. Replacing the goggles as discussed above with those with better, soft rubber compound materials used around the eye area may help alleviate the pressure off from certain areas. Another reason for external compression headaches is the use of earplugs. Earplugs can be the culprit of headaches after swimming because they apply pressure on the inner ear and jaw. Swimmers should use ear plugs that are specially designed for swimming. Using normal regular earplugs may worsen the situation and increase the pressure in the inner ear resulting in pounding headaches. The earplugs specifically designed for swimmers are made up of soft silicon material which prevent water getting inside the ear and also do not exert any pressure on the jawline and in the inner ear. If a person cannot use earplugs because of the persistent headache problem then there are also other options available like mist sprays and swim oils which provide water resistant coating around the ears. It is important to take precautions and avoid water getting in the ears because water inside the ears can cause other problems like swimmer’s ear which might lead to infection. People who dive in the water may suffer from headaches due to swimmer’s ears as well. 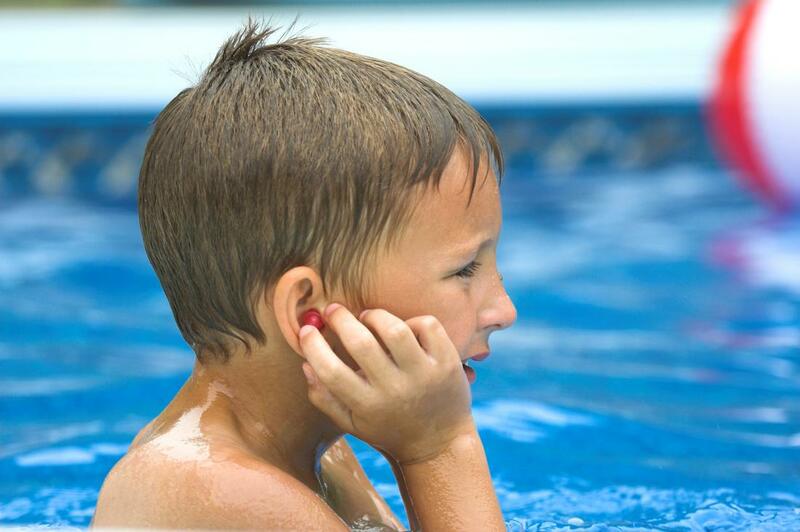 Swimmer’s ear is a condition in which water gets trapped inside the ear canals which then causes bacteria to grow inside the ear leading to infection. This infection can also be factor which might instigate headaches. Another type of headaches that occur after swimming are sinus headaches. Sinus headaches are caused when the sinuses are blocked. This can occur due to pressure changes or irritation from chlorine. Chlorine which is found in pool water can affect the sinus membrane of the nose which can lead to sinus headaches. To avoid irritation in the nasal lining from chlorine water, swimmers should use nose clips which prevent water entering the nose. Buying nose clips that are made of soft silicone material help seal the nostrils and the water from the pool does not enter the nose. These soft nose clips are easy to wear and swimmers do not even feel them after a while. Swimmers can prevent sinus headaches triggered by swimming by wearing nose clips if irritated nasal linings and sinuses from chlorine water is the culprit. Being hydrated during any exercise is crucial. Drinking ample amount of water to keep your body cool and hydrated during any intense physical activity is extremely important. Dehydration can be dangerous and lead to other problems. Lack of water intake leads to dehydration which can result in headaches especially during physical workouts. Body heats up as the heart rate is elevated, therefore drinking plenty of water being exercises and also keeping a water bottle near you during exercise is important. Dehydration may also cause headaches during and after swimming. Swimmers should take care of their water intake if they plan to go on for a swim in the morning. They should increase their water intake the night before in order to stay hydrated. They should also pack a water bottle in their kits. Similarly to being hydrated proper breathing is also crucial in any exercise form. In some exercise forms, such as yoga breathing is extremely important, it significantly depends on proper breathing pattern. Therefore, needless to say breathing is extremely important in swimming as well. Swimmers tend to hold their breath under water and do not breathe in oxygen which causes lack of oxygen and can result in headaches. Every muscle in the body needs oxygen to play its part that is why if a person lacks oxygen in the system, headaches are the most common sign. To avoid lack of oxygen, swimmers should regularly come to the surface to breathe and avoid holding their breath for longer period of time. They should breathe through their mouths during laps to avoid water getting into the nose and the nasal lining. If water gets into the nose and goes further up then it might lead to other problems due to the chlorine in the water. Using a nose clip and breathing through the mouth in a regular pattern can help solve the issue.